A note arrives from Jennifer Saia, President of The Sacks Group Yachting Professionals to say that, for the third successive year, Broward's 36.88m megayacht Java will serve as the Hospitality Yacht at this year's Fort Lauderdale Boat Show. Built in 1990 and refitted in 2003, Java accommodates 10 guests in a full-beam master, two queens and two twins. Currently asking $3.9 million, her central agent for sale, Bruce Schattenburg, adds, "If not sold by the time of the Show, she will be auctioned at the show on Sunday, November 1st. Brokers are welcome to attend." 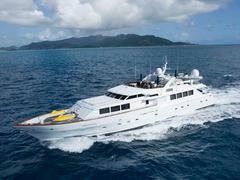 Also on show and for sale through Bruce is Feadship's 30.78 classic 30.78m Calypso. Built by the De Vries yard in 1971 and last refitted in 2008, she sleeps six guests in a master and two twins and is asking $2.795 million.